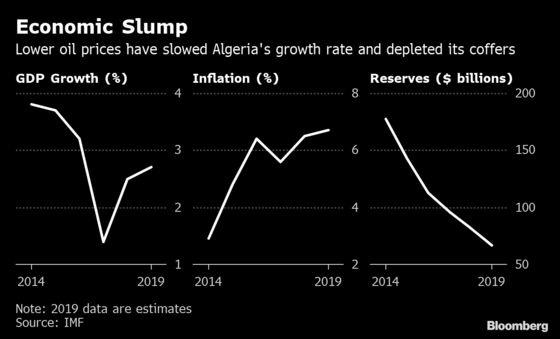 (Bloomberg) -- Whoever replaces Algeria’s President Abdelaziz Bouteflika, ousted by weeks of protest, will inherit another crisis-in-the-making: the economy. Even before hundreds of thousands of Algerians began their campaign for political change, the government had only a few years worth of foreign currency reserves left. With the OPEC member heading into uncharted territory after Bouteflika resigned on Tuesday, the clock to financial upheaval is now ticking faster. The promise of change preached by the revolts that swept the Arab world this decade has usually petered out when it came to the hard choices: take painful measures to fix enfeebled economies or placate angry populations demanding more from an often-rapacious ruling elite. It’s a pattern likely to be repeated in Algeria, one of the most closed economies in the region, where the population of 42 million is already hooked on benefits the state can scarcely afford. Countries roiled by unrest in the 2011 Arab Spring uprisings witnessed a slowdown in economic growth of about 2.2. percentage points on average in the subsequent years compared to the preceding decade, according to London-based Capital Economics. Listen to Bloomberg’s podcast on the Algerian crisis. Barely touched by the 2011 uprisings, Europe’s third-largest gas-supplier is already struggling to sustain a generous subsidy system that’s bought peace at the expense of financial stability since the collapse of crude prices five years ago. 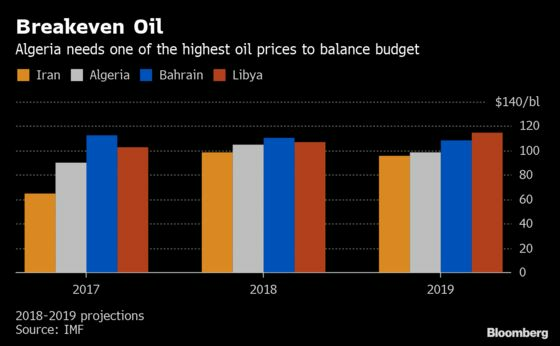 The oil price crash blew the budget deficit to near 16 percent of gross domestic product in 2015; Algeria had planned to bring it closer to 10 percent in 2019. Its current-account gap, in double digits for three years, was still expected at 9 percent of GDP in 2018, according to the International Monetary Fund. International reserves have fallen by more than half since peaking in 2014, with Algerian authorities projecting the stockpile would drop further to $68 billion in 2019, based on a conservative budget that assumed an average oil price of $50 per barrel. As it relies almost entirely on oil and gas exports for its foreign currency earnings, the government would need crude prices nearer $100 a barrel to balance its budget in 2019. The IMF has advised Algeria to gradually depreciate its currency, borrow externally and open up its economy to more international investment to help ease the imbalances. However, a political class composed of aging veterans from Algeria’s war of independence is reluctant to take on much external debt after being forced to restructure billions of dollars worth of loans from foreign banks in the 1990s. The government hasn’t issued international bonds. Instead, it’s sought to dampen demand for foreign currency by imposing restrictions on the imports, while trying to plug the budget deficit with a five-year program that relies on borrowing from the central bank. 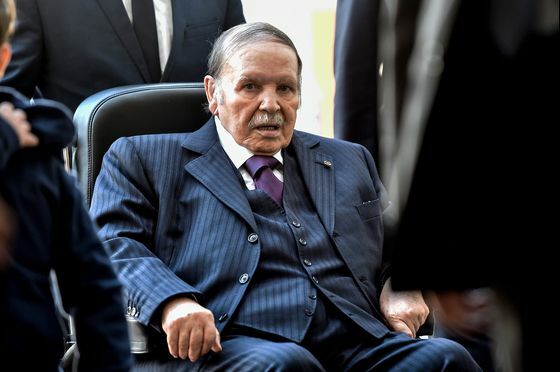 Though six weeks of demonstrations have succeeded in removing Bouteflika, they appear unlikely to ebb any time soon as the aspirations of protesters have grown with their confidence. Protesters now want to dismantle a political system they say is inherently corrupt and has concentrated wealth in the hands of a few crony businessmen. Suspicious that foreign debt or investment would “mortgage” Algeria’s hard-won independence to outside powers, the government failed to diversify the economy away from hydrocarbons and create jobs badly-needed for a youthful workforce, about 40 percent of which is employed in the public sector. Only five companies are listed on the Algerian stock market, which is closed to foreign investors. Unlike other North African countries, which attract millions of tourists a year, Algeria hasn’t developed a tourism industry, missing out on another potential source of hard currency. Inflation is rising and so is domestic energy consumption. Though the government is working to boost gas production and upgrade its refining capacity, it has struggled to attract foreign investors not content with the terms on offer. 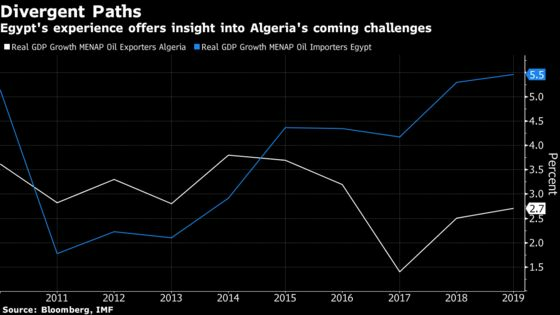 Algeria’s decision-making process is opaque and political risks are high while the North African country has cycled through six oil ministers since 2010. In the four years after the 2011 ouster of President Hosni Mubarak, Egypt halved its foreign reserves while economic growth all but ground to a halt; foreign investments and tourism revenue dried up. International investors fled its stock and debt markets. Eventually, Egypt had to implement a sweeping program that included cuts to energy subsidies and a major currency devaluation. That helped it secure a $12 billion IMF loan, replenish foreign reserves and revive growth. Algeria’s pressures are different. Its lack of connectedness to the global economy has insulated it from the devastating impact of market volatility seen in Egypt. It’s also left it with more work to do to build a modern, diversified economy. The country’s finances are so precarious Capital Economics was already predicting a depreciation of 25 percent in its currency before the unrest.